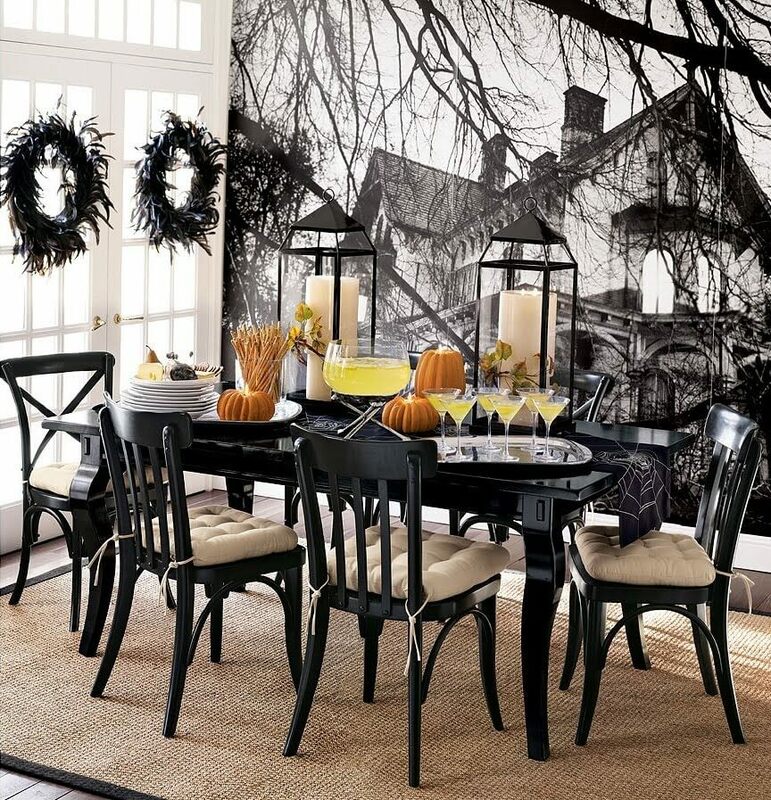 Decorating the house for Halloween is no longer difficult, all thanks to the wonderful ideas and designs floating around the internet. But with loads of ideas comes greater confusion too. There so many themes, colors and patterns to choose from, especially during Halloween, that it gets a bit overwhelming. 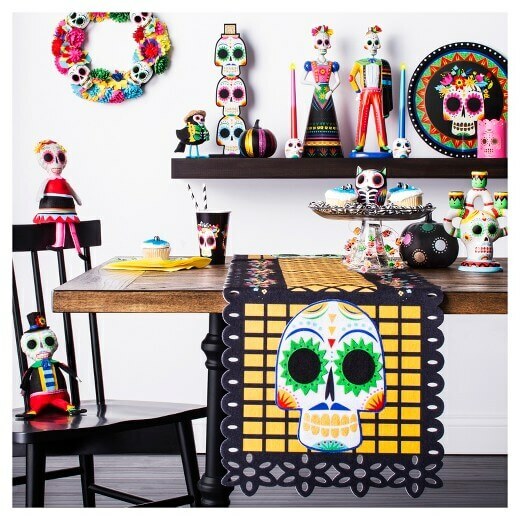 But if you’re looking for some unique Halloween table setting ideas, we’ve got it sorted for you. 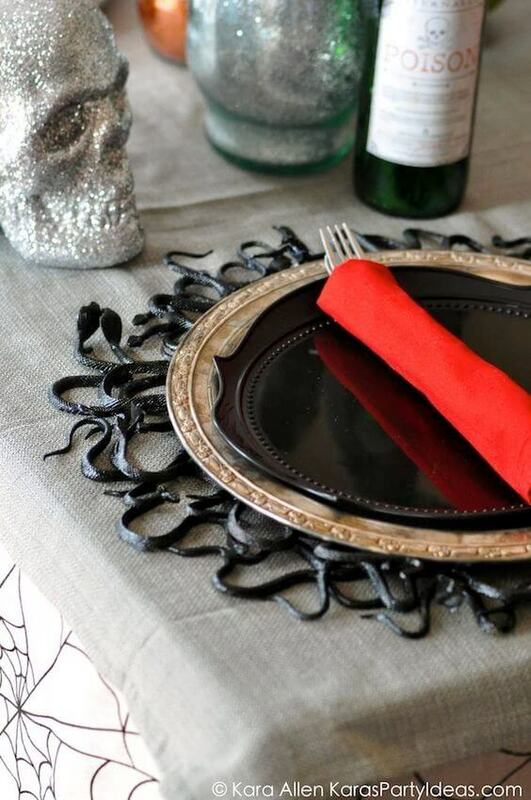 From simple to complex to plain creepy, we’ve narrowed down not one or two, but 30 Halloween table decoration ideas. 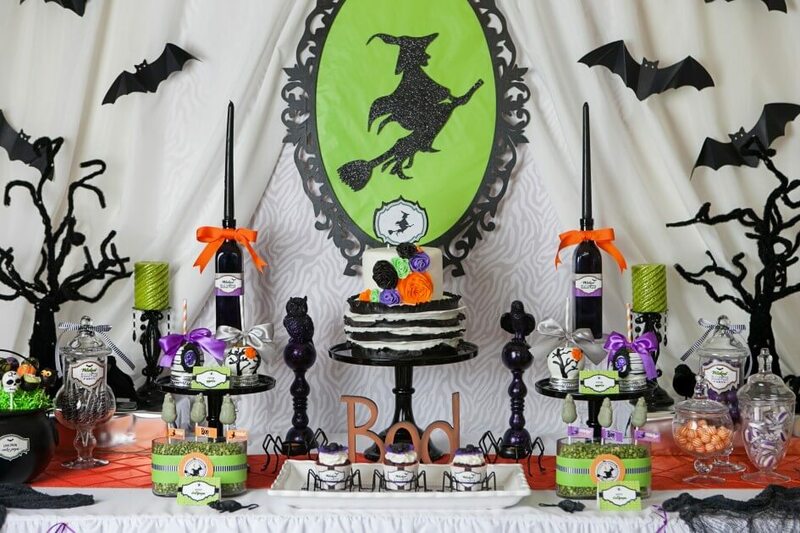 We’re starting our list with a beautiful and Halloween friendly party table decoration. 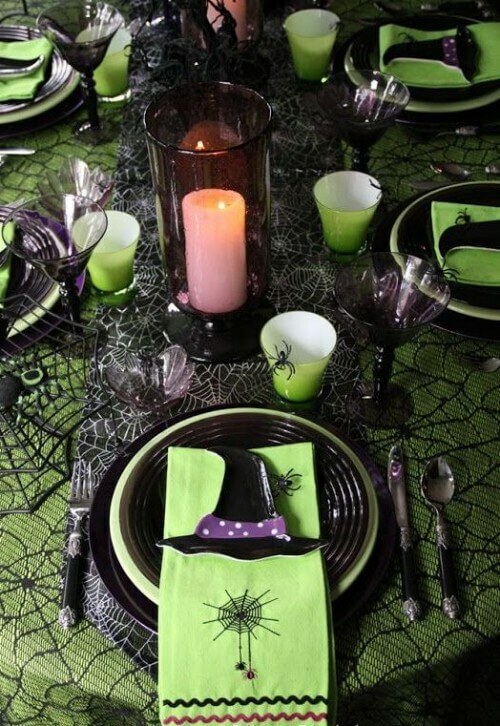 Nothing spooky or creepy has been used in the table setting, which implies that it’s set for the kids. And yes, we totally love the black and lime green combination. This is quite an intricately made skull and replicating it won’t be easy. But if you truly want it, you can definitely make it. Don’t forget to give this skull a moss bed. Do you know what we like the most about the Halloween? The fact that there are no hard and fast rules in decoration. You can combine several elements to create a centerpiece, as seen in the picture. 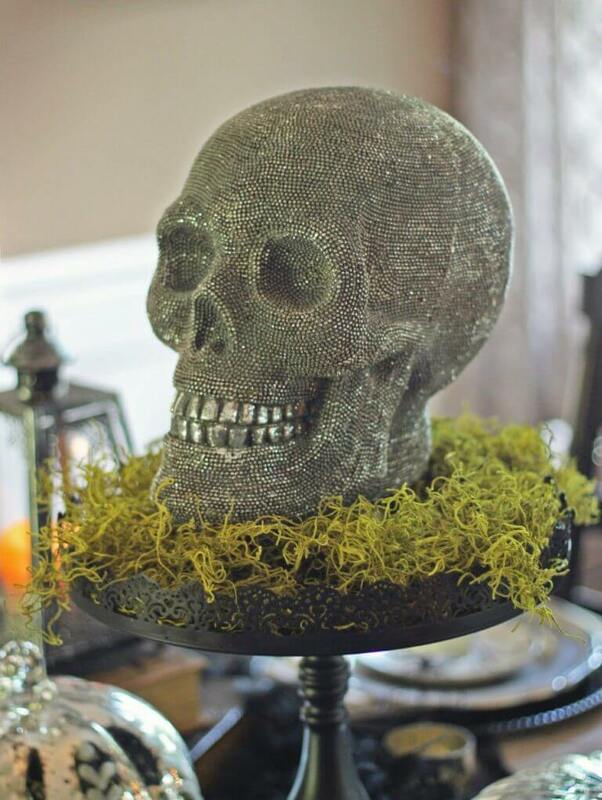 We loved the idea of incorporating glitter in the décor. 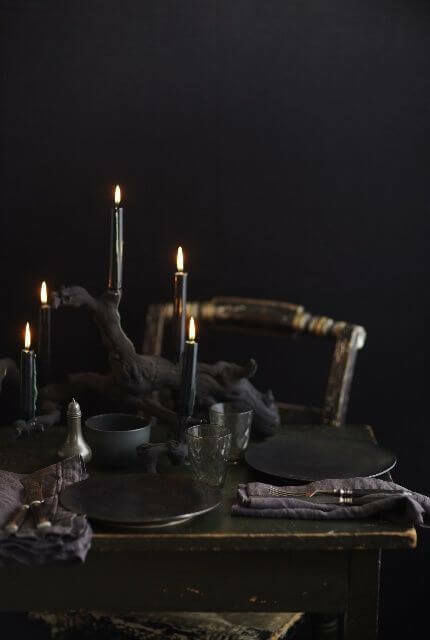 This one’s such a simple, yet spine chilling Halloween table decoration. 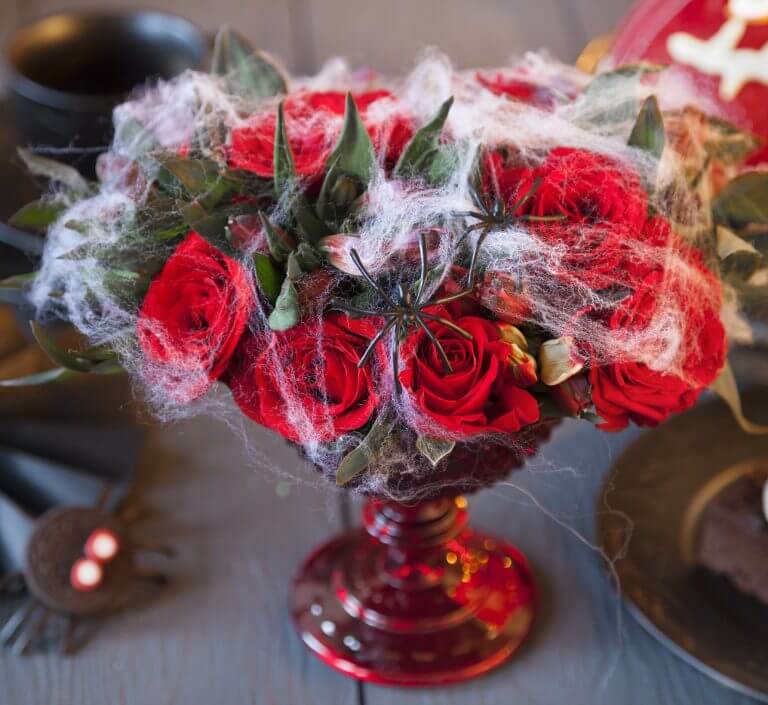 Red roses, covered in spider webs conjure images of haunted house and creepy mansion. 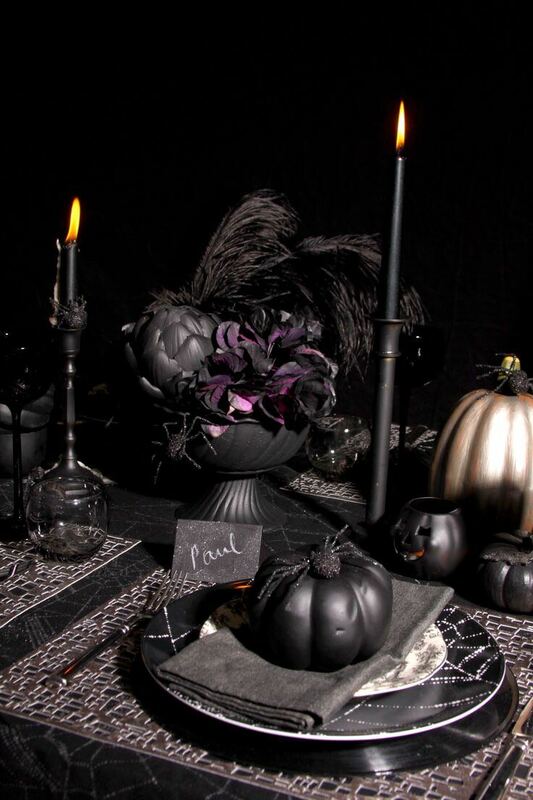 A perfect Halloween centerpiece indeed. 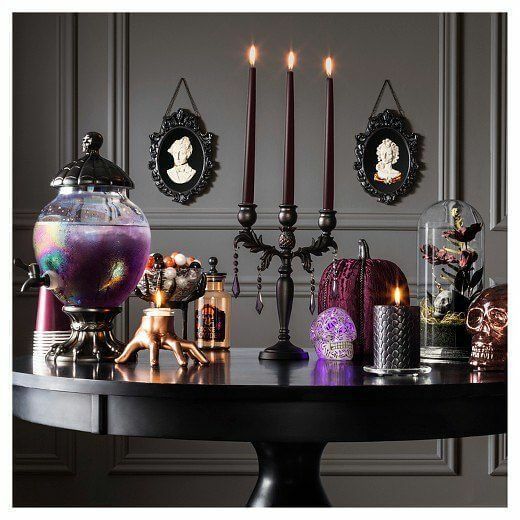 Black is indeed both beautiful and terrifying and this Halloween table decoration is a living proof of that. 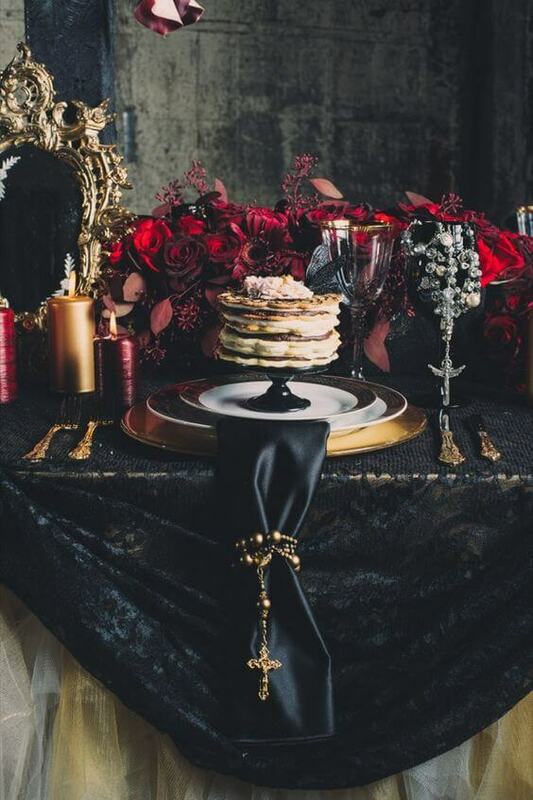 The table setting is totally fitting the theme and is exuding eerie and scary vibes. 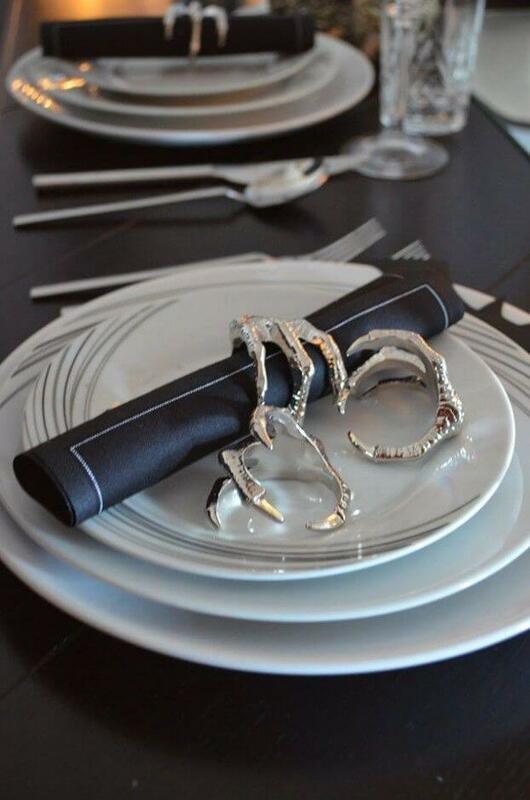 So you can this table setting is serving its purpose well. 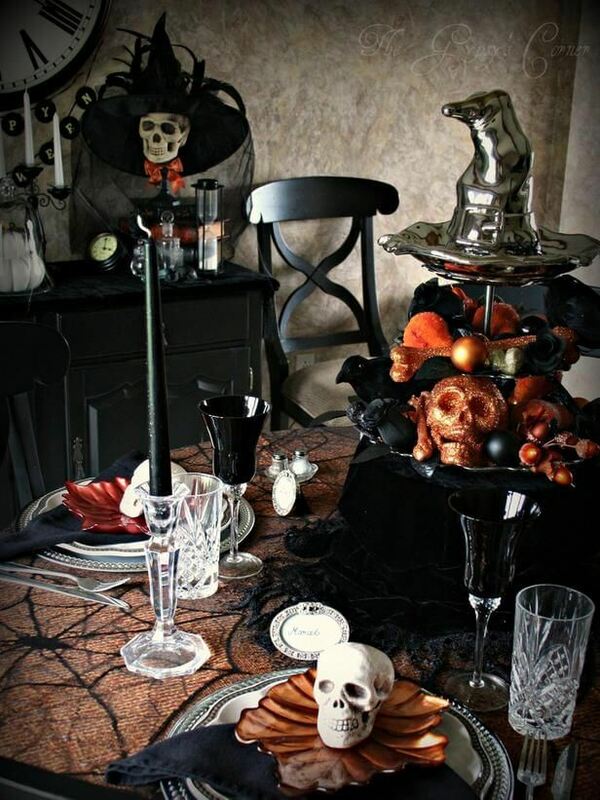 This table, with all the skulls and witch’s top hat as the centerpiece, seems to have been set for the dead. 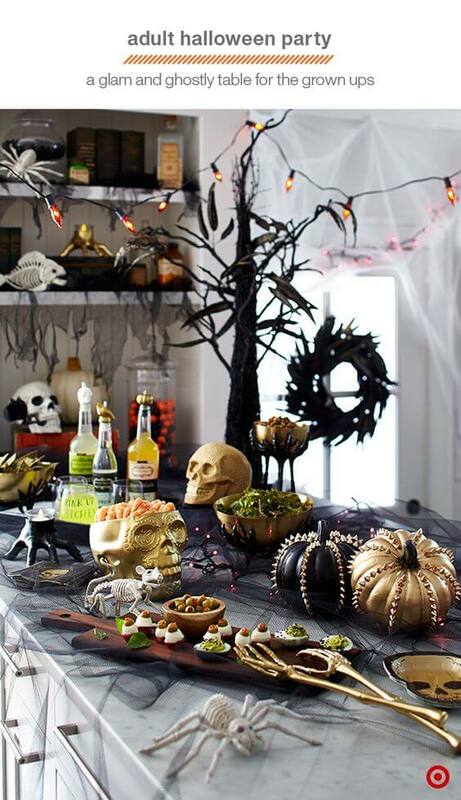 If you’re planning this theme, we’d suggest you pick some of the gross Halloween recipes. If you want to scare your friends, make them sit in such a way that they’re facing the poster. For better effects, turn off the lights. They’ll freak out in no time. If Adam’s family were alive this time, they’d probably set their table in a similar manner. We must say it looks really elegant! This idea may be relatively easy to recreate, but the impact it’s creating is really strong. 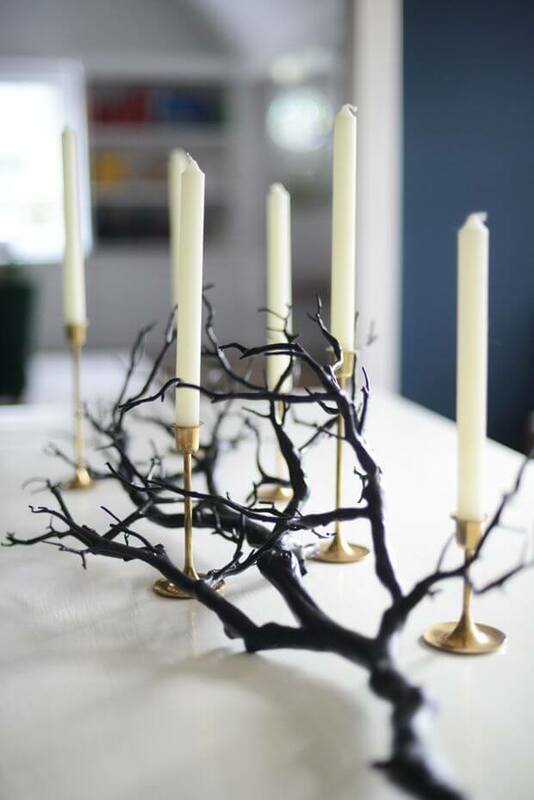 If you’re planning something similar, ensure that you paint the branch black first. 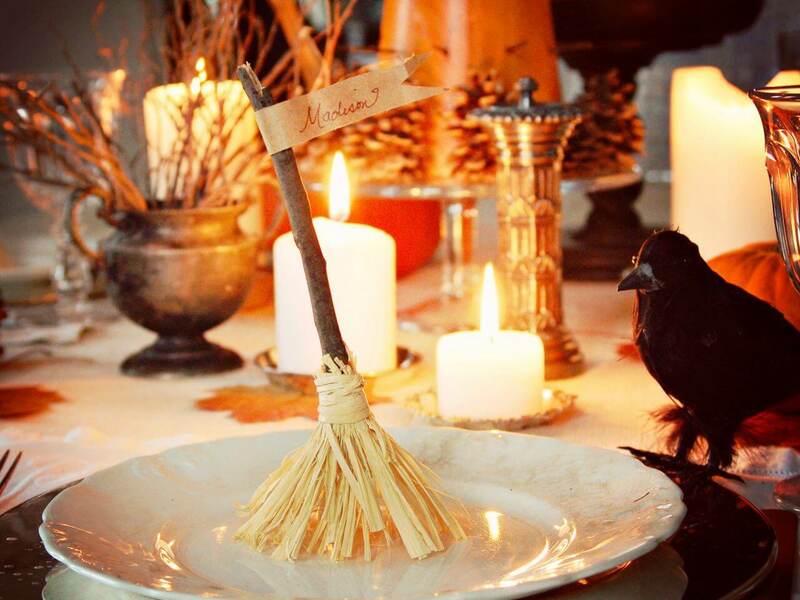 Wicked and beautiful, that’s precisely what describes this table decoration best. Just a single element, a red rose is making the entire setting lovely and scary. 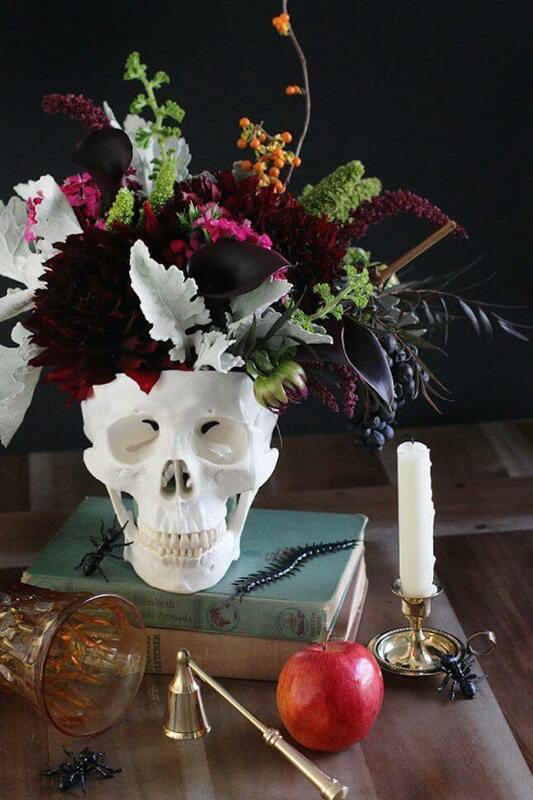 A skull centerpiece filled with flowers- such a beautiful way to represent death. The centipedes and scorpions are adding to the spooky effect. The entire table setting is breathtaking, but the nameplate is definitely taking the cake. Such a simple, yet effective addition. The blackbird is also giving a great touch. 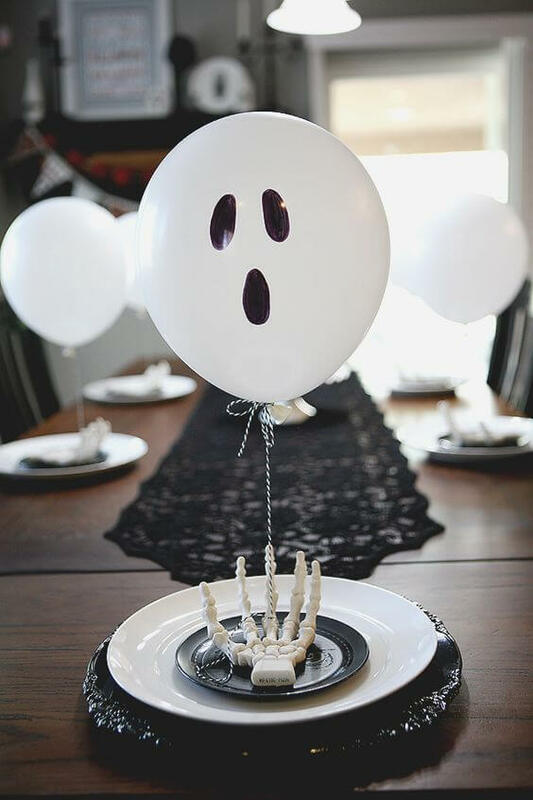 Here’s another spooky way to set up the table. 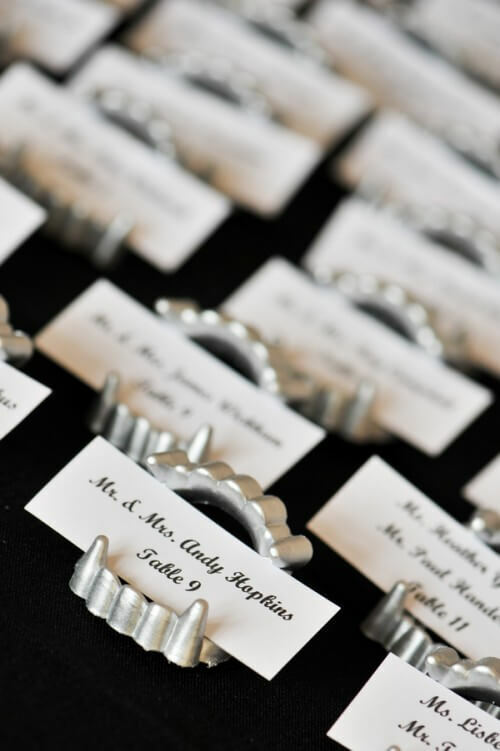 Paint the vampire or Dracula teeth silver and affix the name card to it. This one’s dark and creepy and is best suited if you have only adults coming over. 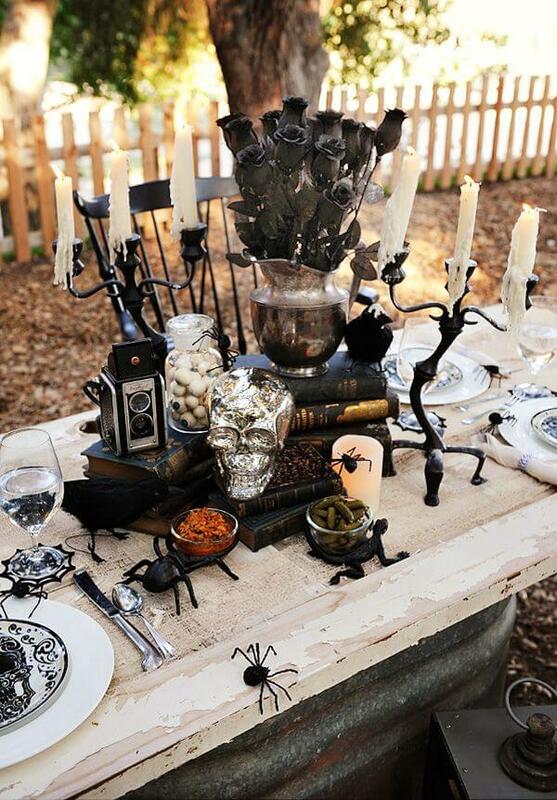 The all black centerpiece with creepy crawlies is making our skin tingle. Before anything else, let us tell you we’re totally loving the lime green glasses. It looks so fresh and pleasant. The witch hat napkin holder is also great. Now this is one of the creepiest napkin holders we’ve seen in the recent time. It’s basically a claw painted silver. 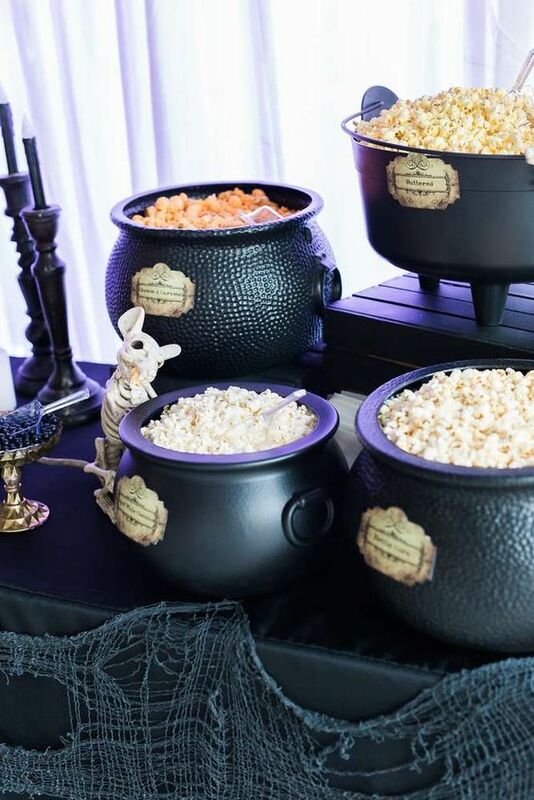 This is one of the cutest and inexpensive ways to dress up your Halloween table. Just ensure that you make the ghost’s face properly. No compromise on this. This table is inspired by Edgar Allen Poe’s legendary poem “The Raven”. It’s dark, broody and captures the spirit of the Halloween really well. At least you can be rest assured that you won’t be attacked by a ghost while you’re enjoying the meal. The cross wrapped around the table napkin will take care of everything. How about using snakes as the plate charger? No, we’re not talking about real snakes, but fake snakes formed together to create a plate charger. Black and Halloween are synonymous. 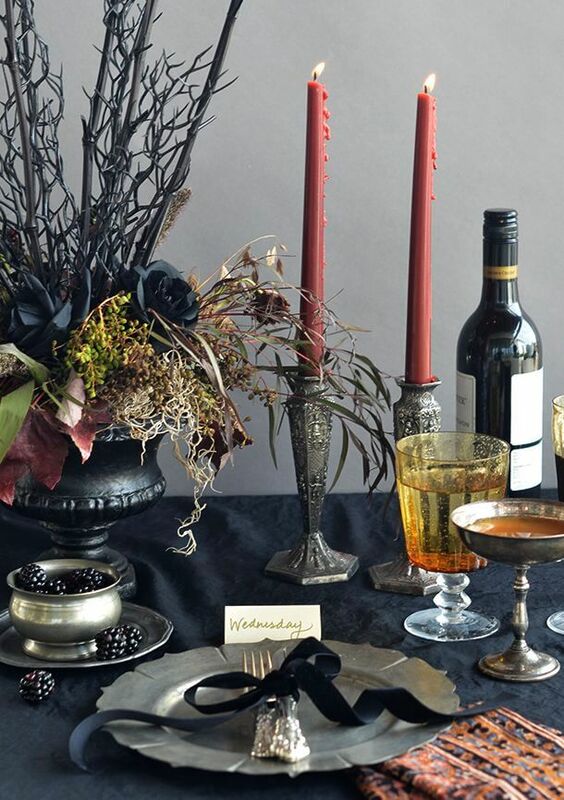 So we’ve combined both in this absolutely stunning Halloween table setting. 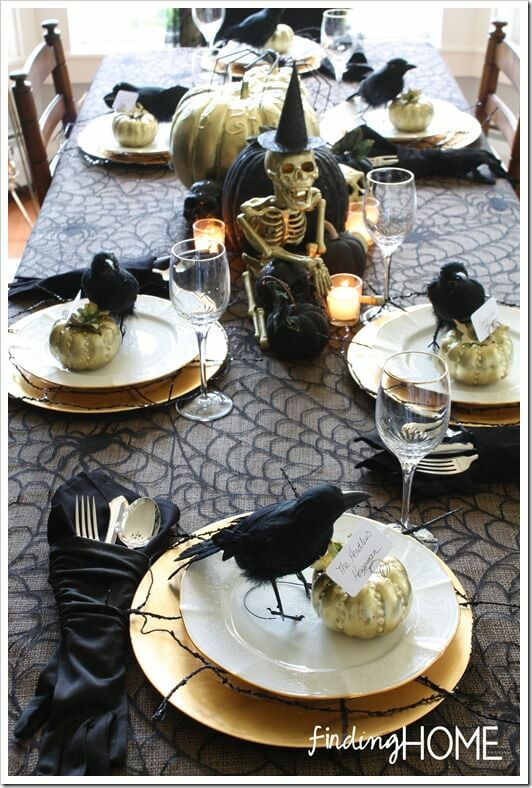 If you have kids coming over, give your Halloween table a similar look with jack-o-lantern balloons and plastic mice. 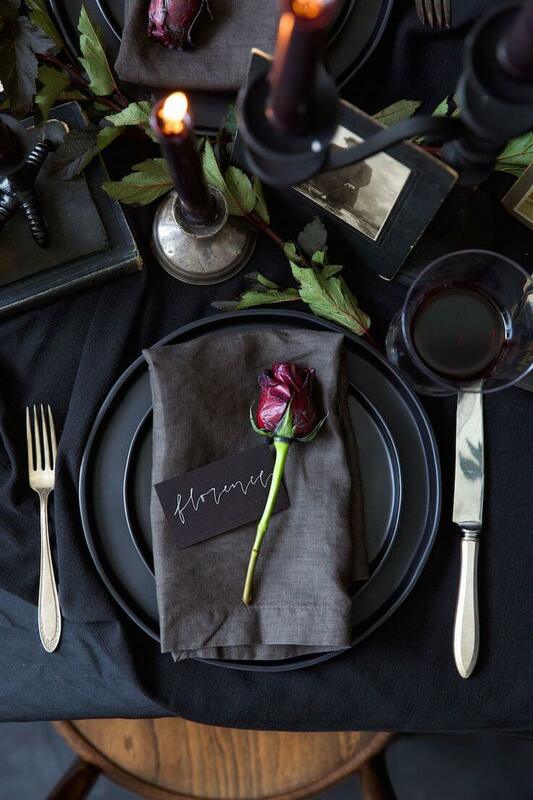 Here’s a modern and beautiful Halloween table setting idea. The hand shaped candle holder is unique and the pitcher is also an excellent addition. A Halloween party does not always have to be gross. 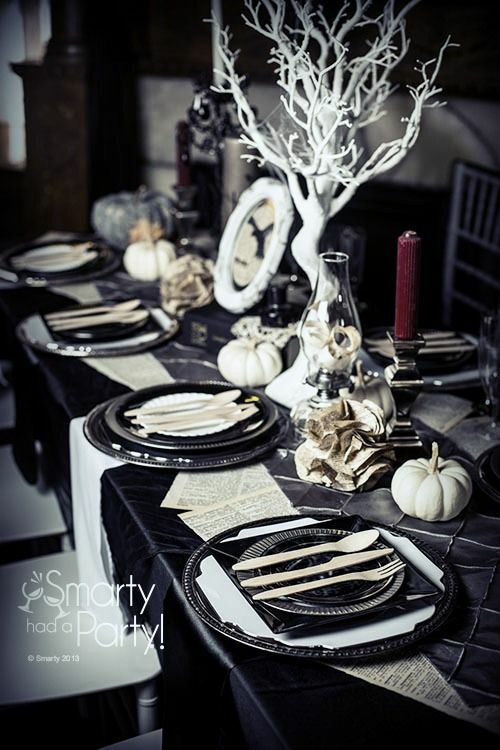 You can make some effort to create an elegant and sophisticated Halloween table setting. The guests will be mighty impressed. The dead party never looked so colorful and whimsical before. 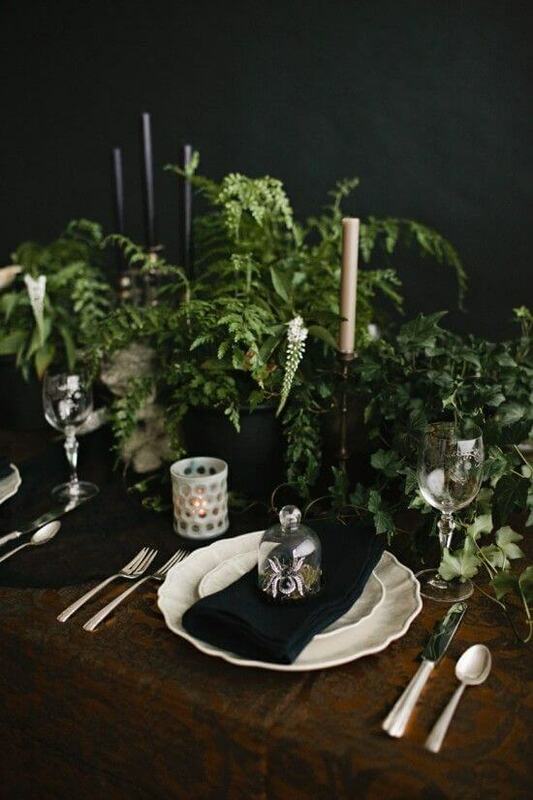 Give a fresh look to your Halloween table by incorporating greens in it. 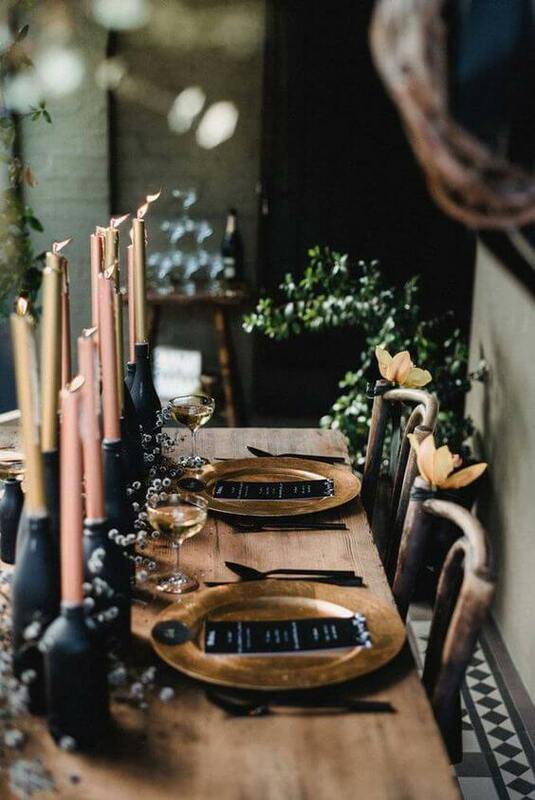 The best way to glam up a table is by using some golden props and elements in it, as seen in the image above. Ravens and pumpkins look cool and stuff, but the strange yet distinctive skeleton centerpiece is making all the difference. 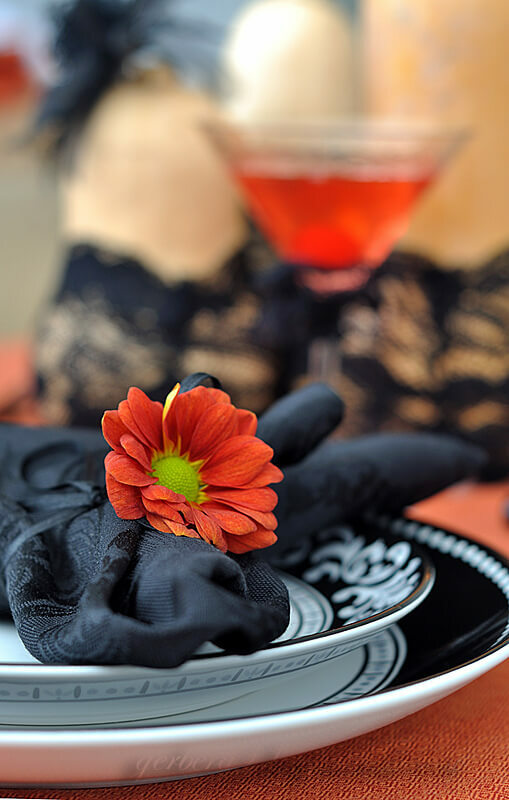 Give a subtle nod to Halloween by tying your black table napkin with orange flower. 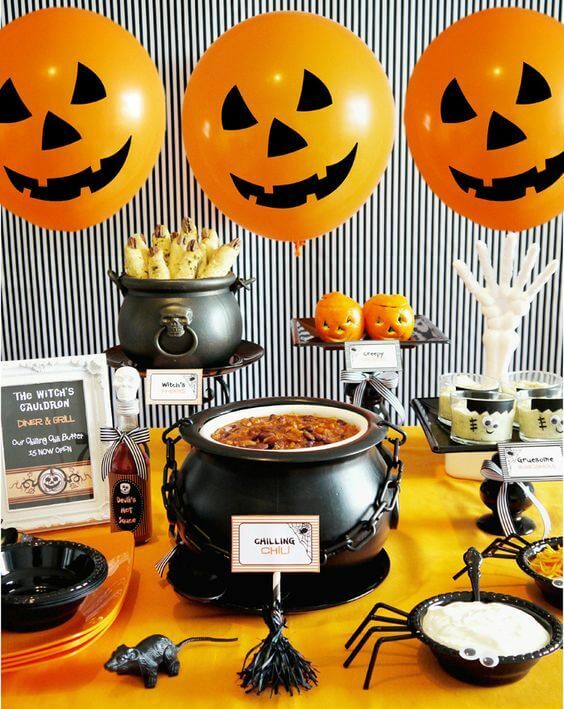 One of quirkiest Halloween table decoration ideas is using cauldron shaped utensils for serving the food. Now all you need to do is shortlist your favorite idea or theme, prepare a list of materials required and go shopping. The table setting can be done a day before. 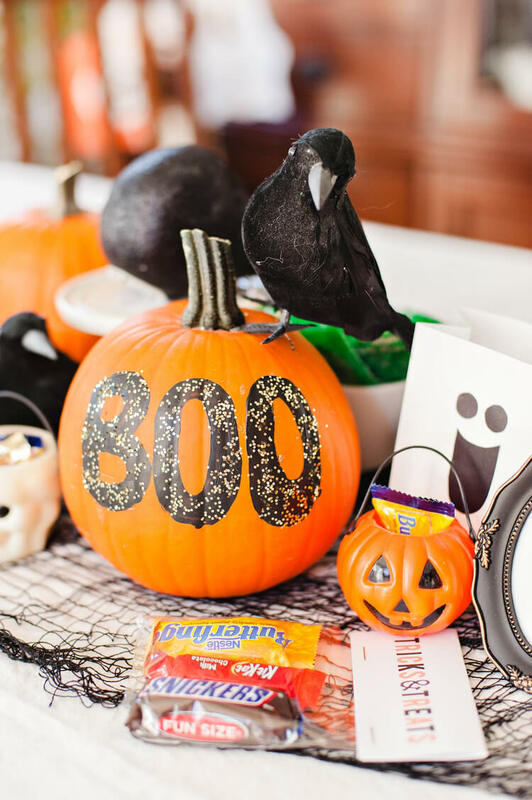 And if you have any more Halloween table decoration ideas to share with us, or any tips or tricks, shoot a comment below.